On trains, the air brake is the fail-safe brake patented by George Westinghouse in 1872, which is released when the engineer allows compressed air to enter the train air line and applied when the pressure is released. On many trucks and buses, the air brake is applied, using compressed air, on depressing the brake pedal. To the right is a simplified diagram of an air brake distributor as used on railroad rolling stock, based on a design by Westinghouse Brake and Signal Co. Ltd. Brake distributors are the devices which control the pressure in the brake cylinders along the train according to the way in which the engineer controls in the train brake pipe. In order to charge the system, the engineer allows the normal maximum pressure (about 5 kg/cm2) to prevail in the train pipe (1). 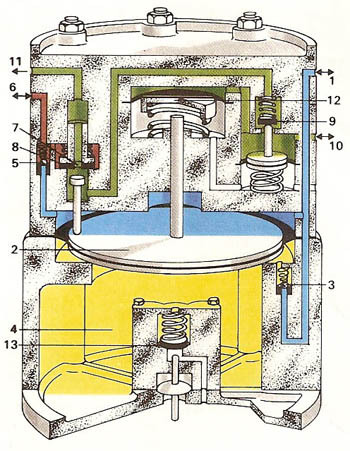 Air thus enters the area (blue) above the main diaphragm (2) and flows through non-return valve (3) into the control chamber (4 – thus providing a reference pressure). It also flows through non-return valve (5) to charge the auxiliary reservoir (6 – red). To apply the brakes, the engineer allows the pressure in the train pipe to drop (to about 3.4 kg/cm2). The pressure difference across the main diaphragm moves it upward, closing the exhaust port (7) of the inlet/exhaust valve (8) but allowing air from the auxiliary reservoir (red) to pass through this valve and the limiting valve (9) to the brake cylinder (10). To release the brake again, the engineer again increases the pressure in the train pipe, allowing the exhaust port on the inlet exhaust valve again to open, and the brake cylinder is vented to the atmosphere (11 – green), while the auxiliary reservoir is recharged through valve (5). Additionally, the upper diaphragm (12) and limiting valve system allow the brake to be applied partially when intermediate pressures prevail in the train pipe. Should the train pipe be broken, or in an emergency brake application, the pressure in the train pipe drops to atmospheric pressure and the brake is fully applied. When the vehicle is parked, the control chamber can be vented manually through valve (13). As described here there is only one train pipe. Often a "two-pipe" system is employed in which there is a separate continuous air supply to the auxiliary reservoir.